The weather looks better than last Sunday. 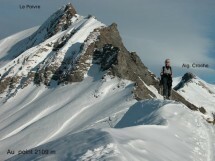 I organize a winter hike to the Col de l'Aup Couti from Abondance (60 km from Geneva) on Sunday February 21th. A starting gently sloping to the chalets of Lens. Then joining the GR5 until Bassachaux neck and the neck of the Aup Couti (1812 m). A circular route. A superb very progressive snowshoeing. Price 5 Euros including insurance. Transport: passenger pays 12 Euros to the driver. If you do not have your own snowshoes, you can rent them in advance (for a list of rental places see http://www.sindy.ch/snowshoes.doc - in addition, there is Cactus Sports in Carouge) and our association can rent snowshoes (8 euros). A gradient of 800 m and a distance of 14 km. Walking time: about 5 hours.